These DIY Pokemon paper puppets have filled our house with so much fun and they’re super easy to make! Grab some paper and scissors and join us for this bit of Pokémon fun. 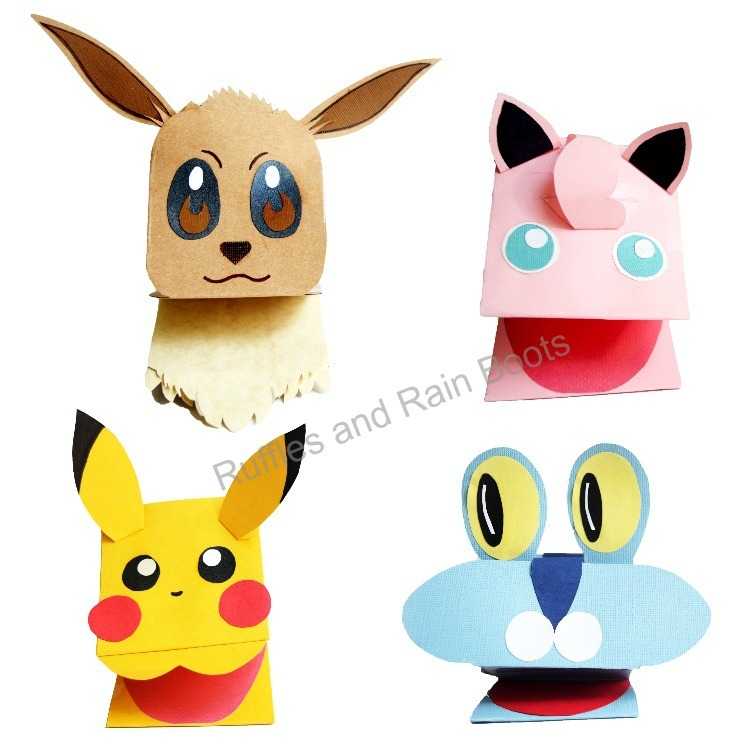 Everyone will love these Pokémon puppets! Whether you play Pokémon Go or you’re a fan of the ‘old school’ pocket monsters, these cuties are sure to entertain. So there SHOULD be one more supply: templates. Buuuuuuut, because we did these so long ago (back during the height of the Pokémon Go craze in the summer of 2016), I’ve misplaced the templates I made for these. The good news is that these are super simple shapes to create so you won’t even need a template. You can use the image below as a guide or just wing it. We wanted to make all of the Eevee evolutions because WHY NOT!?!? but we were distracted by actually playing Pokémon go. If you end up doing that, pop on over to the Ruffles and Rain Boots Facebook page and share it there. I folded the puppet base first (see notes on sizing below) and then used that to sketch a few renditions of eyes and ears. Once I had the right sizing, I cut out everything and then set myself to gluing. Note: read through the “Pokemon Faces” section below before you cut because you’ll need to create a tab. That tab is how all of the pieces stand up and bring your paper Pokémon puppets to life. Note: I’m going to use images from our popular paper dragon puppet tutorial because the process is the same. 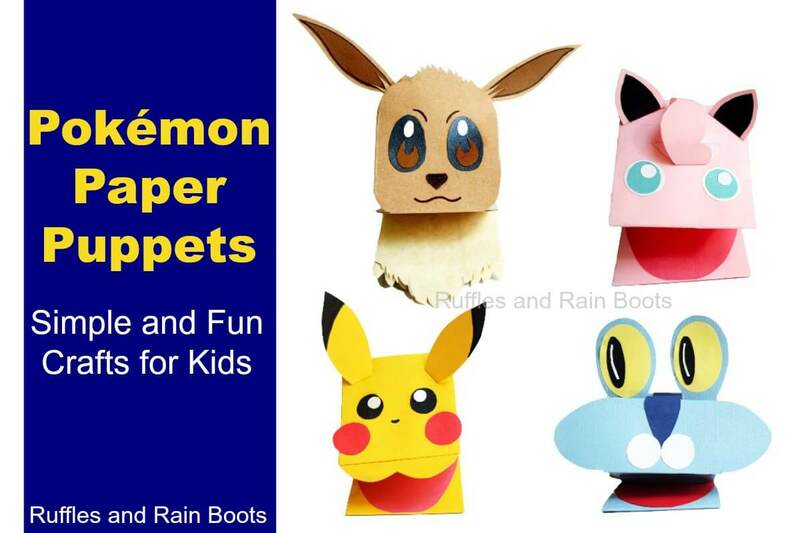 For younger, child-sized paper Pokémon puppets, follow the instructions here. For a larger version, lightly fold the paper in half to find the center. Then fold each edge to the center and secure with tape. Continue folding the body as in step 2 of the image below. 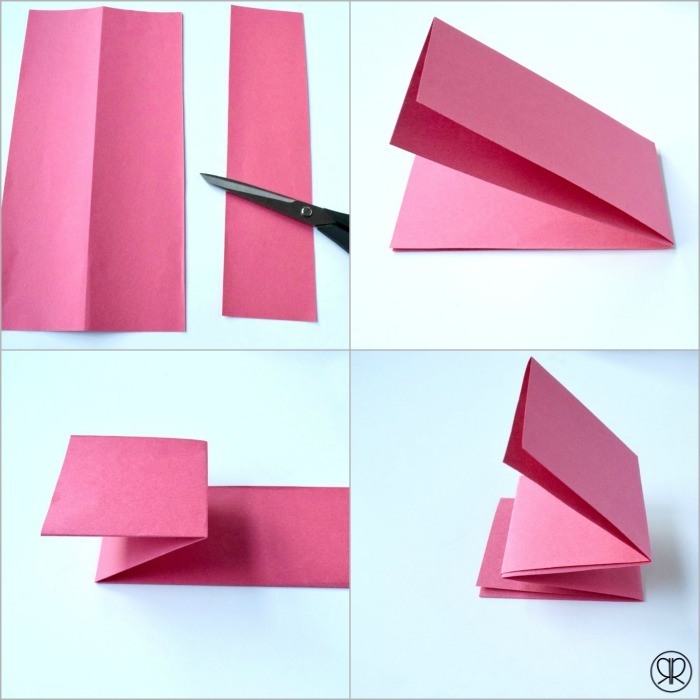 Fold a piece of paper into thirds lengthwise and cut off one of the sections. Fold the paper back in half lengthwise and fold on the width of the paper. Take it just more than halfway and fold it back. Flip it over and do the same thing. Tape up the long side folds (1 piece of tape per section is fine). Note: for Eevee, after the half fold, fold again just a bit farther than you would for the other puppets. Eevee’s head is longer, so you want more surface area for it (and those big, beautiful eyes). For the faces, all pieces should have an extra tab. Bend that tab back and affix the piece so that it stands up or out from the head. For example, Pikachu and Jigglypuff have ears that have tabs. The Jigglypuff and Froakie Pokemon paper puppets have tabs for larger pieces (the hair tuft and face, respectively). Fold the tabs back, secure with tape and glue, and they will stand up and give the puppet dimension. On the Eevee Pokémon puppet, you might consider trimming the face on the edges. Take care not to go too deep with the curve, but a little snip here goes a long way for this cutie. These DIY Pokemon paper puppets have filled our house with so much fun and they're super easy to make! Note: read through the "Pokemon Faces" section below before you cut because you'll need to create a tab. That tab is how all of the pieces stand up and bring your paper Pokémon puppets to life. Note: I'm going to use images from our popular paper dragon puppet tutorialbecause the process is the same. The Jigglypuff and Froakie Pokemon paper puppetshave tabs for larger pieces (the hair tuft and face, respectively). Fold the tabs back, secure with tape and glue, and they will stand up and give the puppet dimension. These Pokemon paper puppets have been going strong here for a while (we made these in August of 2016 and we still have 2 of them left (April 2018). The neighborhood kids (and parents) have all had their turns acting out battles in our living room! My son loves Pokemon. What a cool idea!